Test accelerator under construction at Cornell will reuse energy, running beams through multi-pass magnets that help keep size and costs down. 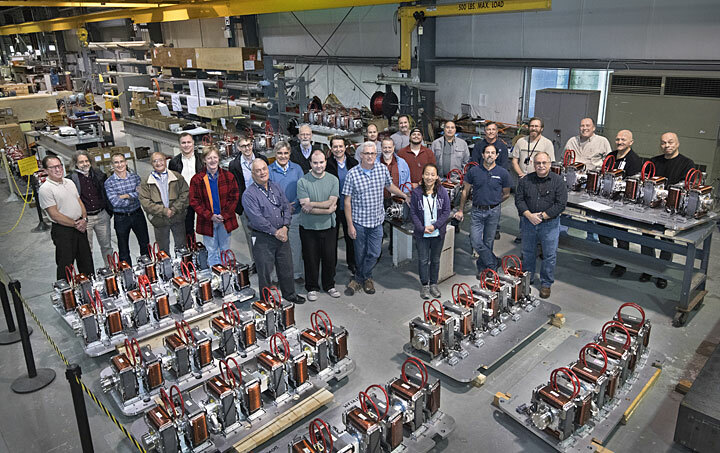 Members of the Brookhaven National Laboratory team with the completed magnet assemblies for the CBETA project. 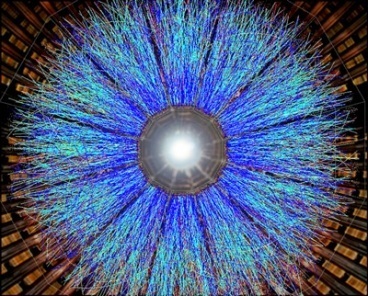 When it comes to particle accelerators, magnets are one key to success. Powerful magnetic fields keep particle beams “on track” as they’re ramped up to higher energy, crashed into collisions for physics experiments, or delivered to patients to zap tumors. Innovative magnets have the potential to improve all these applications. That’s one aim of the Cornell-Brookhaven “Energy-Recovery Linac” Test Accelerator, or CBETA, under construction at Cornell University and funded by the New York State Energy Research and Development Authority (NYSERDA). CBETA relies on a beamline made of cutting-edge magnets designed by physicists at the U.S. Department of Energy’s Brookhaven National Laboratory that can carry four beams at very different energies at the same time. “Scientists and engineers in Brookhaven’s Collider-Accelerator Department (C-AD) just completed the production and assembly of 216 exceptional quality fixed-field, alternating gradient, permanent magnets for this project—an important milestone,” said C-AD Chair Thomas Roser, who oversees the Lab’s contributions to CBETA. The novel magnet design, developed by Brookhaven physicist Stephen Brooks and C-AD engineer George Mahler, has a fixed magnetic field that varies in strength at different points within each circular magnet’s aperture. “Instead of having to ramp up the magnetic field to accommodate beams of different energies, beams with different energies simply find their own ‘sweet spot’ within the aperture,” said Brooks. The result: Beams at four different energies can pass through a single beamline simultaneously. In CBETA, a chain of these magnets strung together like beads on a necklace will form what’s called a return loop that repeatedly delivers bunches of electrons to a linear accelerator (linac). Four trips through the superconducting radiofrequency cavities of the linac will ramp up the electrons’ energy, and another four will ramp them down so the energy stored in the beam can be recovered and reused for the next round of acceleration. Even when the beams are used for experiments, the energy recovery is expected to be close to 99.9 percent, making this “superconducting energy recovery linac (ERL)” a potential game changer in terms of efficiency. New bunches of near-light-speed electrons are brought up to the maximum energy every microsecond, so fresh beams are always available for experiments. That’s one of the big advantages of using permanent magnets. Electromagnets, which require electricity to change the strength of the magnetic field, would never be able to ramp up fast enough, he explained. Using permanent fixed field magnets that require no electricity—like the magnets that stick to your refrigerator, only much stronger—avoids that problem and reduces the energy/cost required to run the accelerator. To prepare the magnets for CBETA, the Brookhaven team started with high-quality permanent magnet assemblies produced by KYMA, a magnet manufacturing company, based on the design developed by Brooks and Mahler. C-AD’s Tuozzolo organized and led the procurement effort with KYMA and the acquisition of the other components for the return loop. Engineers in Brookhaven’s Superconducting Magnet Division took precise measurements of each magnet’s field strength and used a magnetic field correction system developed and built by Brooks to fine-tune the fields to achieve the precision needed for CBETA. Mahler then led the assembly of the finished magnets onto girder plates that will hold them in perfect alignment in the finished accelerator, while C-AD engineer Robert Michnoff led the effort to build and test electronics for beam position monitors that will track particle paths through the beamline. “Brookhaven’s CBETA team reached the goals of this milestone nine days earlier than scheduled thanks to the work of extremely dedicated people performing multiple magnetic measurements and magnet surveys over many long work days,” Roser said.